George Best signed print - Manchester United v Benfica 1968 The late great George Best personally signed limited edition print. Best is captured turning away from goal to celebrate Manchester United's second goal against Benfica in the European Cup Final at Wembley in 1968. 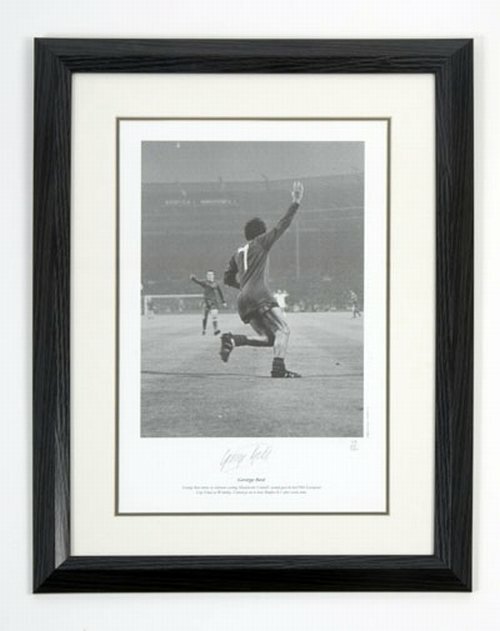 The late great George Best personally signed limited edition print. Best is captured turning away from goal to celebrate Manchester United's second goal against Benfica in the European Cup Final at Wembley in 1968. The late great George Best personally signed limited edition print. Number 113/250. Best is captured turning away from goal to celebrate Manchester United's second goal against Benfica in the European Cup Final at Wembley in 1968. This high gloss limited edition is mounted and framed and measures 22” x 16”. Double mounted in white and charcoal grey with a 1.5” black wood effect frame. This item is very heavy. please contact us before placing to your order to agree delivery costs to your location.